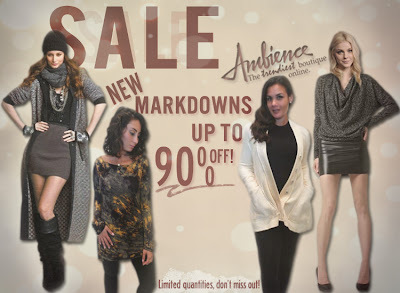 Sale: Up to 90% Off!! Tops, bottoms, dresses, sweaters, outerwear...you name it, we've got it! And we've got it on SALE! New markdowns, deeper discounts, lower prices. Gorgeous designer fashions as low as 90% off! You can't beat that. Limited quantities, so don't miss out. Now's the time to grab that awesome piece you've been eying up. Go ahead, you know you want to.